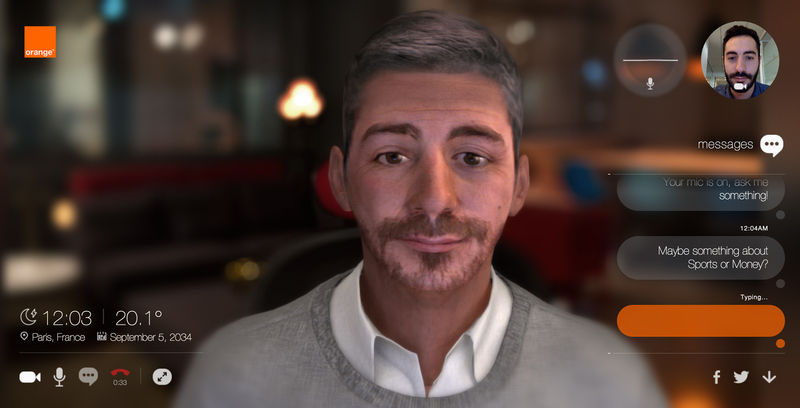 Twenty years from now, I'll be a silver-haired fox and speak with a British accent, judging from this "Future Self" campaign created by Publicis Conseil and Jam3 for European telecommunications giant Orange. Upload a photo of yourself, and the software creates an interactive 3-D model of how you might look two decades hence. You can ask questions of your future self using your computer's microphone or keyboard. Of course, these are canned responses, but most of the exchanges I sampled were amusing, and a few even felt kind of profound. When I inquired about my (his? our?) finances in 2034, Future Dave explained that money as I know it no longer exists, that it's been replaced by a system of commerce in which nobody feels short-changed. It's livelier than Merrill Edge's somewhat similar "Face Retirement" campaign, and more fun than this site, which emphasizes an aspect of the future I'd just as soon ignore.